At Lugarde we offer a high quality product for a reasonable price. In our own factory we make first class quality products. We have an eye for detail. This quality and attention to detail reflects in the finished product. All of the following features are standard and are included within the price! Lugarde doors and windows are very robust and solid. Doors and windows have high quality double glazed sealed units (4+16+4 argon gas filled with a high insulation value of 1.1). All windows are sealed with silicone sealant. Doors and windows are fitted with drainage holes. All doors are fitted with a 3-point security locking system (brand Maco), provided with a hallmark. Doors and windows are manufactured from laminated timber. This helps to prevent warping. All windows and doors are fitted with rubber draught excluders. Sprung handle (choice of chrome or brass). Handy adjustable split hinges including protection covers for the hinges (choice of chrome or brass). Doors are fitted with aluminium wear strip to protect the threshold. Crossbars have a simple click in clip system. Very handy for painting and cleaning. Doors can be hinged on right hand side without an extra charge (doors as standard are left hand hinged). Roof shingles as standard on all pyramid and apex roofs. Choice of black, blue, brown, green and red. Choice of a chrome/brass ball, weather-vane or weather-witch (for pyramid roofs). The inside of our pyramid summerhouses are finished with a decorative wooden knob. Flat roofs will be delivered with wide aluminium roof trims, high quality EPDM rubber, glue and water outlet. Log cabins are finished with a beautiful metal ridge finial with Lugarde logo. Foundation beams are pressure treated and fixed together with aluminium corner clips. Log cabins: straight cut logs instead of diamond cut logs. Walls of 68 mm have a double tongue and groove. Adjustable feet for all posts for the purpose of our log cabins, summerhouses and canopies. Aluminium feet are included for our detached gazebos. Our first class spruce is from northern countries. Through the cold climate trees grow relatively slow. The growth rings are closer together which makes the wood more stable and durable. All our timber is kiln dried in special drying rooms to approx. 14 – 16 % moisture content, as a result, wood shrinkage is reduced. All our timber suppliers are PEFC and FSC certified. We keep wood waste and sawdust to a minimum and reusing it for other purposes. High quality building systems (Prima 3=1 system, Pro-system and log cabin-system). Free skirting boards for internal floors. Drawings are specially made for your summerhouse, log cabin or other canopy. Easy assembly with simple instructions. All fasteners and metalworks come in a handy sportsbag. 5 year guarantee on manufacturing or construction faults. Many of our key features are also visible in our unique 3D-configurator for summerhouses, log cabins, gazebos and more. You can select the roof shingles, the door fitting and the ridge finishing and watch it in 360°! We offer many extra options for your summerhouse, log cabin or canopy. For example, you can choose from different windows & doors, floors, colour-treatment and insulation. Questions, enquirys or more information? Do you have any questions or would you like to learn more about extra options we offer? Or do you have any questions or enquirys? Please contact us. We will be happy to help you! At Lugarde we include a lot in the price as standard. Have a. You can also choose from many optional extras. You will find our range of options on this page below. If you want to protect your summerhouse optimally, you can choose for pre-treating your summerhouse. At Lugarde you can choose between spray-treatment, staining and pressure-treatment. Spray treatment in transparent white, graphite grey, brown or light grey. Your summerhouse, roofing or log cabin is now provided with a primer. The spray treatment will also prevent your summerhouse or log cabin against fungi and the rotting processes. The inside is now protected and you don’t have to paint it again. To protect your summer house or log cabin against other weather influences you have to paint the outside within a year. Colourless pre-treatment (primer) on the inside and outside, plus a painted outside including your windows and doors (choice of six colours). With this treatment your summerhouse or gazebo will be protected for 2 -3 years. It is possible to colour the windows and doors differently than the rest of your building. The windows and doors will be provide with 3 treatment-layers. For the best result and a more beautiful finishing you can sand up the timber slightly and give it another layer after assembly. Hereby most of the irregularity will disappear and your summerhouse will be protected for 4 to 5 years. You can order the right colour stain. Your (Pro-system) summer house will be painted with Sigma quality paint. Pressure treatment in green or brown is only possible with log cabins and pro-systems. The impregnating fluid is forced into the timber and there is no need for an additional treatment. A pressure treated log cabin or pro-system has the longest durability. The timber is optimally protected. Painting is an optional extra. Windows and doors are not pressure treated. They can be painted in colour or opaque or can be spray treated. During the first period after pressure treatment the timber can work. The timber can shrink a little. 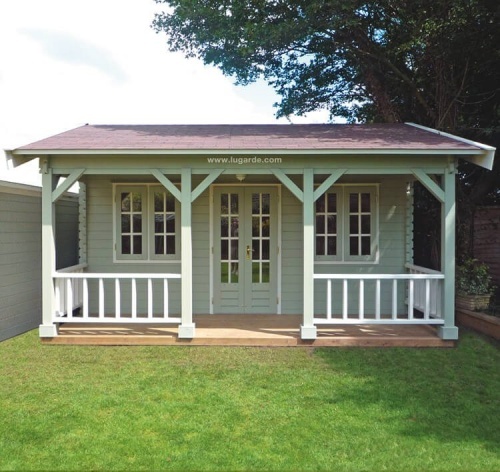 All the options for summerhouses, log cabins, gazebos and more you can find in our 3D-configurator. You can select the terrace floor, glass sliding wall and the desired colour treatment and view it in 360 degrees.